The MTA said they’d look into it and the HPD acted like they had no knowledge of this. Still, lots of people looked a little more suspiciously at those wooden subway benches, as well they ought. Experts tell us that bed bugs are prone to infest public transportation, as a general rule. Now consider for a moment, the curbside refuse of this great city, which is also quite likely to be infested by bed bugs. Bed bugs are in every neighborhood and it seems like the incidence of tossed out mattresses and chairs has gone way up. 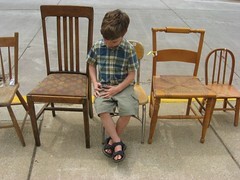 People have always sought out “curbside bargains” like free chairs, tables, and mattresses. It’s considered frugal and green, and what could be better in the days of global warming and the crashing stock market? I’ll tell you what’s better: avoiding bed bugs. Forget the discomfort of bed bug bites, for a moment, which many will never even notice. Those who’ve never experienced bed bugs have no idea how much money they eat up (even if you aren’t the one footing the bill for pest control) and how much of a strain the average infestation is on the environment when you factor in the extra laundry (electricity and water) and plastic bags alone. Before you even talk about replacing some of your stuff and having someone spray pesticides over and over and over. So, I want to stress that I have mad respect for Idealist.org and their cool Idealist in NYC blog. But I have to stress, in the name of sanity, do not do as the Idealist in NYC blog tells you plans to, and try and help tired people find somewhere to sit in the subway by donating curbside chairs. Do not, as the Idealist in NYC blogger cellyham pleads says, “chip in by salvaging chairs from trash piles, cleaning them up and reusing them in one of the hundreds of stations across the city.” Idealist got the idea from this “Dude”. Skeptics also point out the potential for bedbugs and other such creatures. I’ve had my fair share of experiences with creepy crawlers, and I’ll chance another encounter for a shot at comfort any day. But that’s just me. What do you think? All I can say is, think again. Anyone who is willing to “chance an encounter” with bed bugs does not know enough about them or what they do, even in a small infestation. Oh yeah, and the chance of bed bugs on those “donated” chairs in the subway? It doesn’t just amount to you bringing the bed bugs into your digs when you rescue the chair from the curb and clean it up at home. It also stems from the danger of getting bed bugs that have crawled into a chair in someone’s home. The Take a Seat idea’s originator has a nice google map showing where people have placed these chairs so far, and they include some of the most bedbug-infested areas of Brooklyn and Queens, as well as many Manhattan stations. Part of the problem with bed bugs is that most people really do not get (a) how easy it is to just “pick them up” somewhere, or (b) what a pain in the — they really are. Thank you for this post. I have a pest control company in southern California, Hearts Pest Management, that is now doing a lot of bed bug work, but we had not considered approaching the public transportation sector. Roy Edroso at Running Scared has picked this story up. Perhaps a member of the news media could utilize a K9 team to check some of the existing chairs to graphically illustrate the prevalence of bed bugs in the subway stations. According to an article written by Dr Potter of the University of Kentucky… “All modes of transport including trains, buses, taxicabs and airplanes were spreaders of bed bugs” in the late 1930s. History is repeating itself and the learning curve is going to be very steep until our public officials figure out that these hardy little parasites are easily transmitted from person to person in public places. Here is a link to Dr Potter’s article in PCT Magazine. Thanks for commenting. I really enjoyed reading your blog post, and it’s great to see such concern about the rampant bedbug manifestation across NYC. Although I will say that disagree with your use of the phrases “…do not do as the Idealist in NYC blog tells you” and “…cellyham pleads.” There is not a single sentence in this blog post that tells the readers to do anything. I clearly state “The basic idea is that we all chip in by salvaging chairs from trash piles, cleaning them up and reusing them in one of the hundreds of stations across the city,” which is informing readers about the concept behind the project. I also clearly state at the end, “But that’s just me.” The whole point of the post is that I think this is a great idea, but of course, you take a seat at your own caution. NYC is dirty. That’s just the plain truth. I was a Peace Corps volunteer in Guyana a couple of years ago, and can say with authority that I do know what bedbugs are like. There were countless times I awoke with bites, and had to soak my mattress in the sun. I’ve also heard of others accounts’ as well. I am, in all honesty, quite a germaphobe at times. Your post definitely had me think, however, that I should have included more information, and stated more explicitly that taking the chairs is not just limited to salvage piles. I don’t think the intention of this project is to scavenge junkyards. It also includes thinking about that extra chair sitting in your apartment taking up space, and how it can be useful at a subway station. Also, to reduce the chance of bedbugs and other creatures, plastic and metal chairs are a good option as well. The greater problem is the health standards of NYC subways in general. But I do think this initiative is a good first attempt at addressing another problem. Maybe it’s not the perfect solution, but it’s a good step. I’d love to hear more of your thoughts on how you think this specific problem about the lack of seats can be addressed with better safety standards. I appreciate your response. You’re absolutely right, I did misrepresent your tone, and I have attempted to correct this by changing “tells you to” to “plans to,” and “pleads” to “says.” I think that more accurately represents your tone. That said, since you write for the Idealist NYC blog, and are talking about what you plan to do, or think (personally) is a good idea, this does amount to, to some degree, encouraging others to do the same. I appreciate your sharing your bed bug experiences in Guyana. Unfortunately, for New Yorkers, it is extremely hard and often expensive to get rid of bed bugs. In my opinion, it is worth standing on subway platforms rather than sitting in potentially infested (wooden, craggy) platform seats. Simple plastic lawn chairs which have no crevices and which can be washed are a better option, but metal and wooden chairs can certainly become infested. Taking chairs from the curbside isn’t the only problem with this initiative, either. As I noted above, people may potentially bring a chair from their own home that they do not yet know to be infested. Entomologists suggest that as much as 70% of the population does not react in any way to bed bug bites. Since you usually have to have an advanced infestation in order to see bed bugs, this means that someone could easily bring an infested chair to a station (or the curbside) without knowing they had a problem. Finally, campaigning for the MTA to be proactive in searching for bed bugs in stations, trains and buses is a good idea (especially in platform seats and in upholstered bus seats). Bed bug k9s are certainly an option. While not 100% accurate, a good bed bug dog can walk through and quickly detect bed bugs in a way a human simply can’t. If bedbugs spread a virus or other sickness as mosquitoes do, then I think the government would take more of an interest. These things are at epidemic proportions. It is concerning regarding the spread of bedbugs, we have similar projects in the UK and I’m sure they have contributed to the spread of bedbugs. In my neighbourhood, people don’t dispose of things properly – and other people ‘recycle’ them. Having now experienced bedbugs from my neighbours who indulge in such activity, I am warning everyone I know. In general people do not know about bedbugs until they have them, and most people would not tolerate them in their homes. I’m frugal, and I’m green – but I agree, the impact of bedbugs in our home is enormous – the use electricity in cleaning & drying everything, the use of pesticides, and the amount of waste going to landfill. If I did not have bedbugs there are many things that could have gone to charity. I think maybe there should be proper re-cycling centres and furniture should be inspected or treated before people can re-use it. There needs to be more public education about bedbugs. Next post: Greenpoint mattress mountain: bed bugs, perhaps?